In each of the following questions here below, group the given images into three classes using each figure only once. 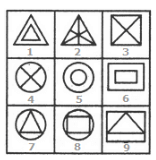 1, 7, 9 contain two similar elements one inside the other but not touching each other. 2, 3, 6 contain two similar elements one inside the other and both touching each other. 4, 5, 8 are divided into equal parts by straight lines emerging from the centre. 5, 8, 9 are objects having both base as well as upper lid. 2, 3, 6 are objects having base but not upper lid. 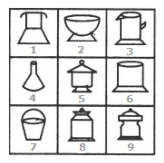 1, 4, 7 tare objects which have neither a base nor an upper lid attached to them. 3, 6, 9 are geometrical figures containing line segments (the number of these line segments is half the number of sides in the figure) parallel to the sides of the figure. 1, 5, 8 consist of a circle and a triangle intersecting it. The triangle is also divided into two equal parts by a straight line. 2, 4, 7 are all funnel shaped figures. 1, 5, 6 have two similar elements, one inside the other. 2, 3, 4 contain straight lines each dividing, the figure into two equal parts. 7, 8, 9 have one element placed inside a different element.